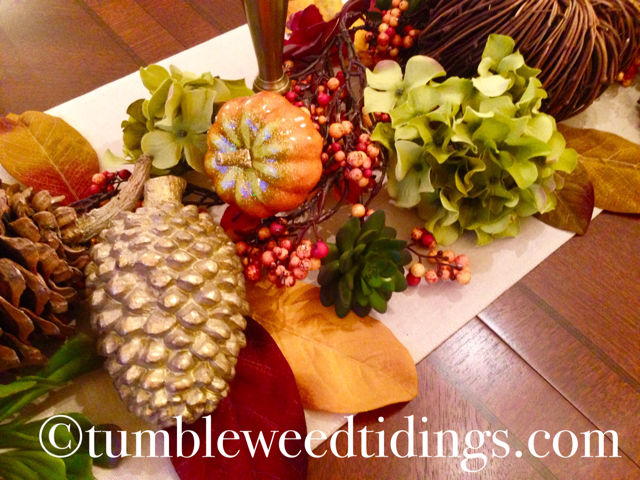 Thank you for checking in with Tumbleweed Tidings today! I appreciate your loyalty and interest in the blog. 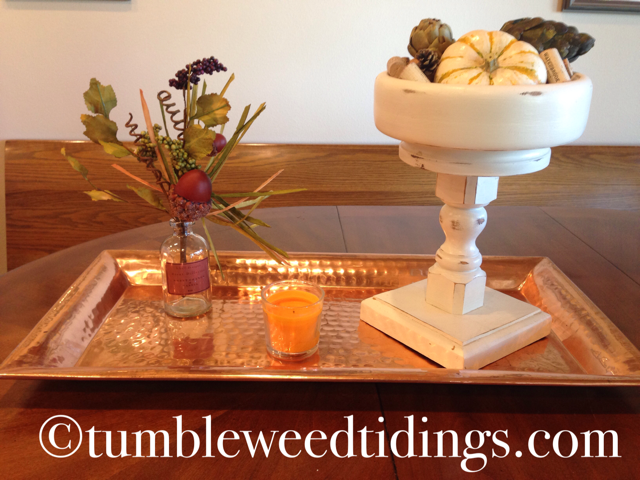 If you like what you see here, you can help me gain readers by Subscribing on the website http://www.tumbleweedtidings.com, and Like and Share on Facebook. And now for today’s post on Fall’ing in Love with Fall! Due to an abnormally long winter that we affectionately named Snowmageddon, it seems like our local schools just released for the summer. Now, after a short, hot, and smoky summer, the days are getting shorter and there is a feeling of fall in the air. Fall just happens to be my favorite season, followed closely by spring. The rustling leaves, cooler days and nights, and autumnal color palette all fit me to a tee. My house loves these colors so much that it wears most of them all year long, and fall is when it finally all makes sense! So it is with some excitement that I start to get our house ready for fall. I see a lot of all white fall decor ideas out there, and have even seen options where blue wanted to be invited to the fall party this year. They are all lovely, but in this house, we pay homage to fall by bringing inside all of the colors of pumpkins, gourdes and falling leaves. 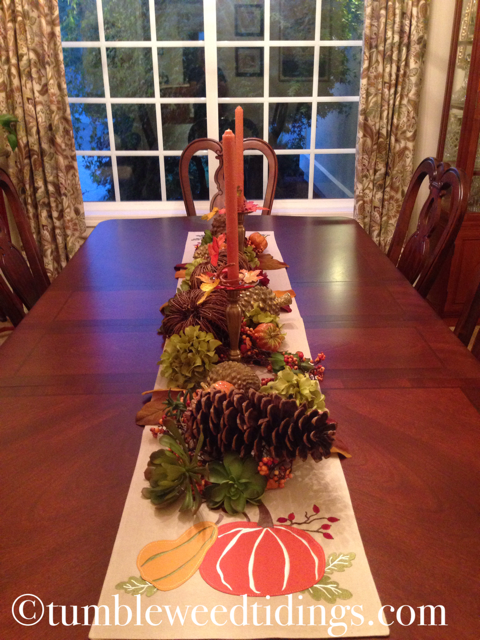 When my three children were young, I marked time with the calendar by changing out our décor seasonally. The kids seemed to like it, and I had fun doing it. Today with our empty nest, I have scaled way back and go with a much simpler approach to seasonal decorating. Having said that, I still enjoy changing out the front door wreath and placing some seasonal items around the main living areas of our home. 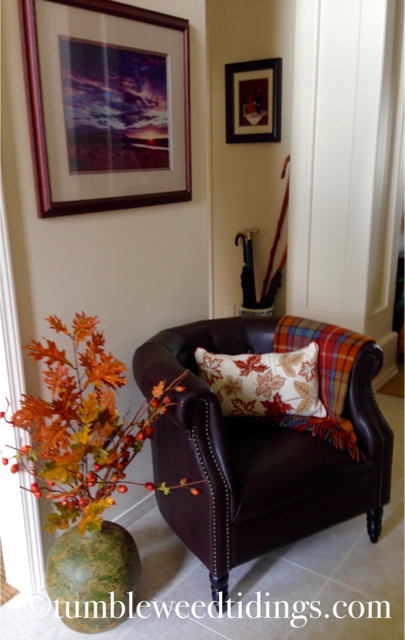 If nothing else, it changes the interior landscape with a seasonal splash of color. 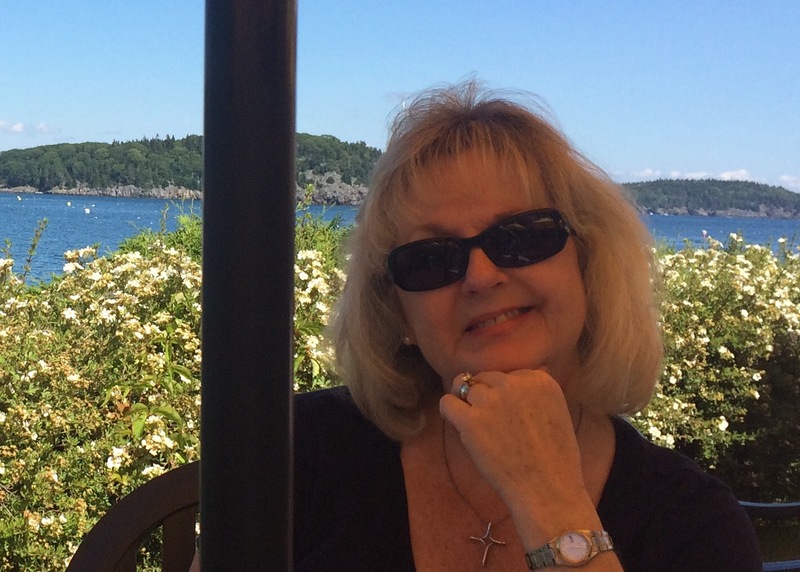 It can be easy to get swept up in Pinterest and other formats (like blogs!) that tend to overdo seasonal decorating. I love these sites for their inspiration too, but sometimes they can be a little intimidating. 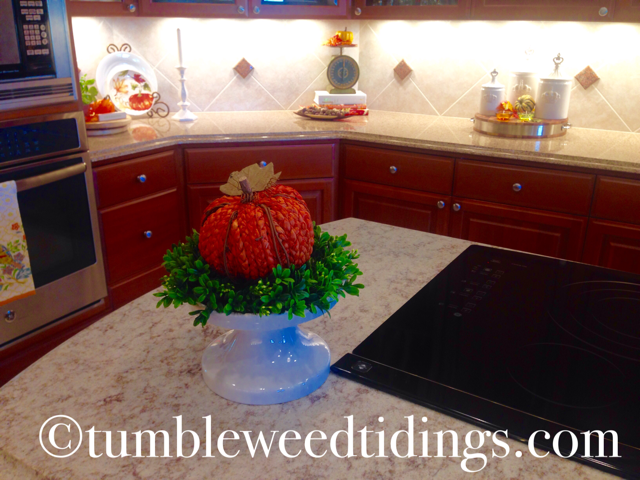 It is entirely possible to give your home a seasonal feeling without breaking the bank or your back, and I’m going to give you some ideas to help you do just that. First, look outside for freebies. We are fortunate to have a couple of pine trees on our property that graciously drop a bounty of pine cones on a regular basis. 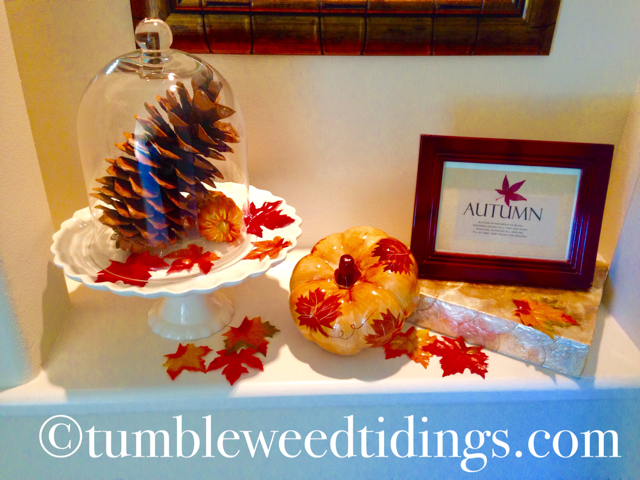 A simple bowl of pinecones with some dried leaves (real or artificial) strategically placed, can make a simple and elegant fall addition. Forage your yard for branches of trees or shrubs that evoke a fall feeling. Placed in large urns or vases they can do the trick. You can purchase seeds for ornamental pumpkins, and plant them in the spring. 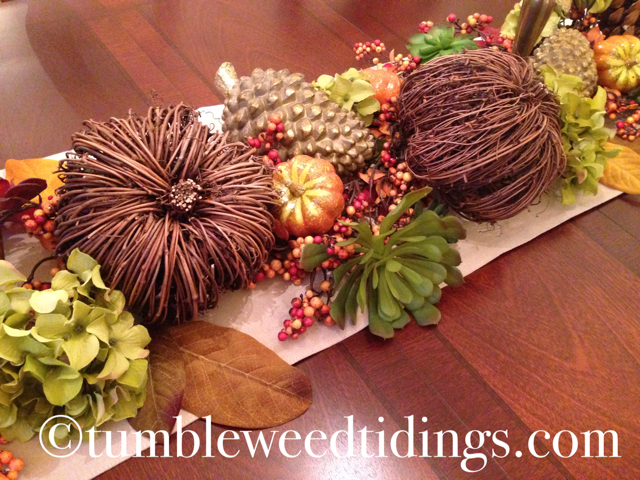 They are fun to grow and use in your fall decorating scheme. 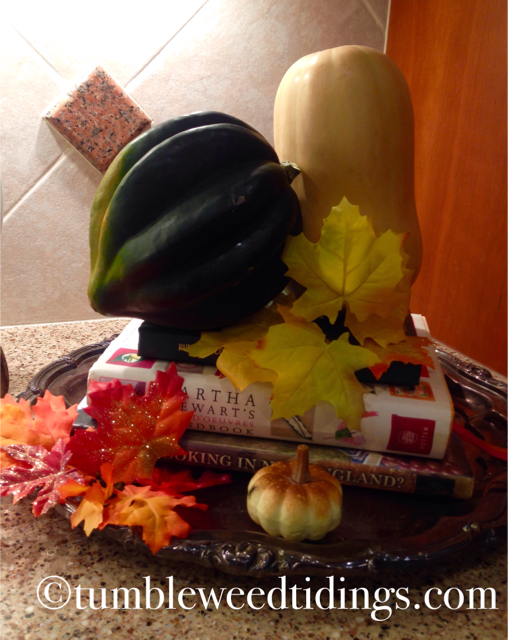 Another obvious free resource for fall décor is to use items you already have and bring them forward from the previous season. This is easily done with succulents and other plants in autumn. A grouping of succulents with a couple of mini pumpkins or leaves placed inside automatically makes it read as fall. 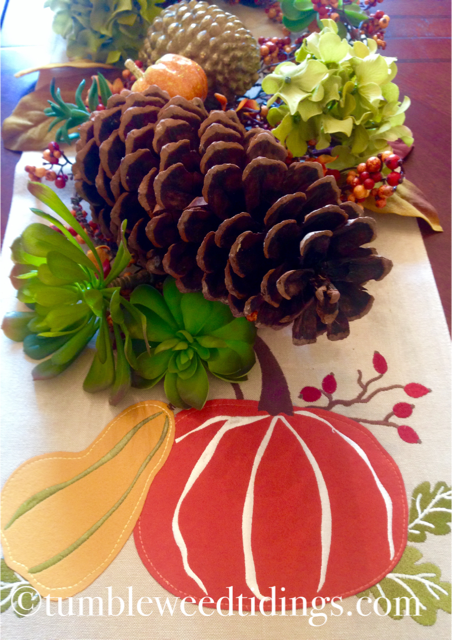 Once you have exhausted free options, it’s time to hit the Dollar Tree and other low cost craft outlets for décor. The usual suspects routinely have coupons for 40-50% off one item, which are nice to save for large ticket items like a wreath or beautiful fall basket. 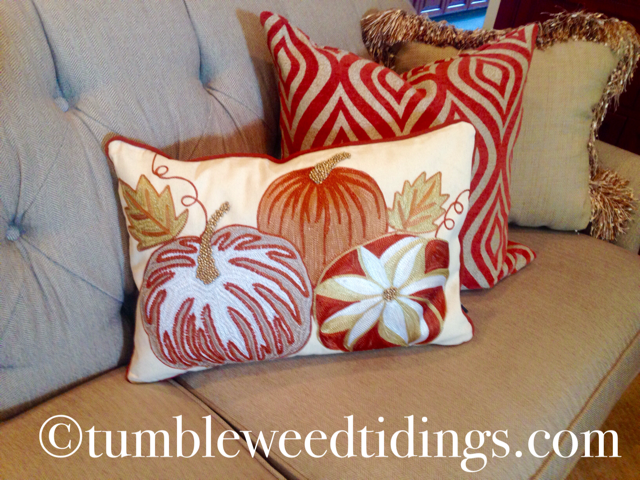 Fall is also the time to bring out any colorful throws and fall toned pillows you may have stashed away. It is easy to extend your outside living season with the addition of some throws placed in a basket for people to use. Don’t overlook the grocery store as another place for fall décor options. 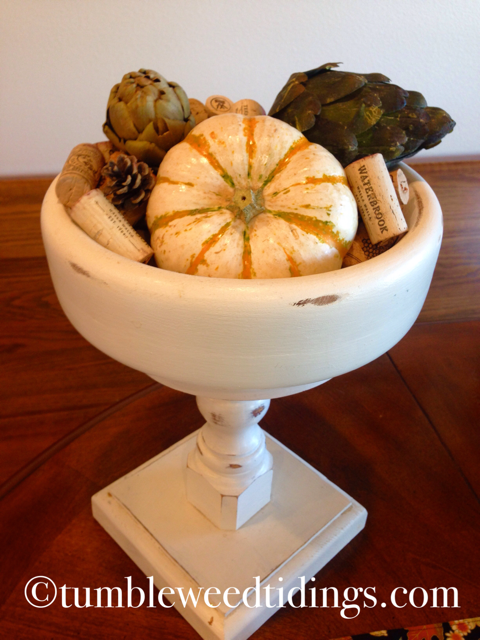 A bowl of artichokes, eggplant and pumpkins placed on the kitchen table can evoke a fall feeling. 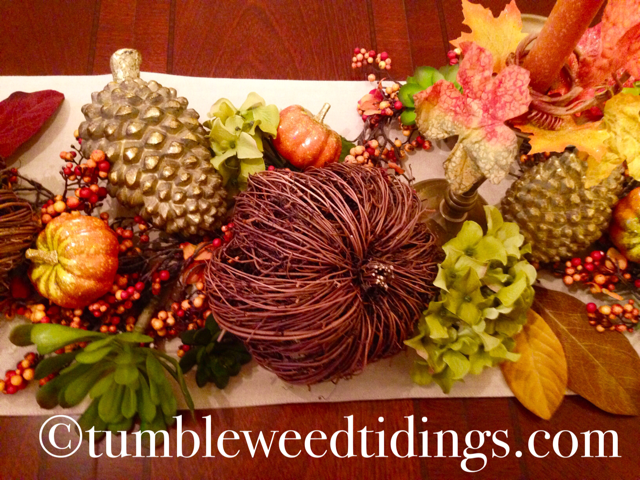 This cornucopia style also makes a great centerpiece idea for fall entertaining in the dining room. The added bonus is that once you’re done with the event, you can eat the centerpiece later in the week. The same applies to a bowl of unshelled nuts placed on the coffee table. Fall also brings with it some sweet treats that are only available during this time of year. 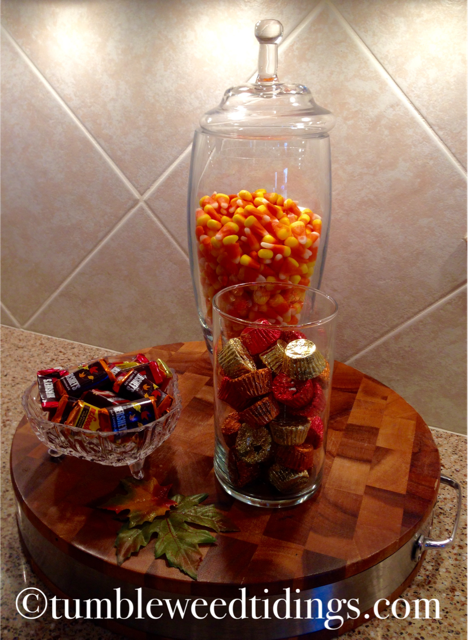 Filling apothecary jars with candy corn or pumpkin shaped goodies from the bulk food section is a great way to incorporate the beautiful shades of fall to your kitchen countertop or island for very little money. And you can eat them, too. Bonus! 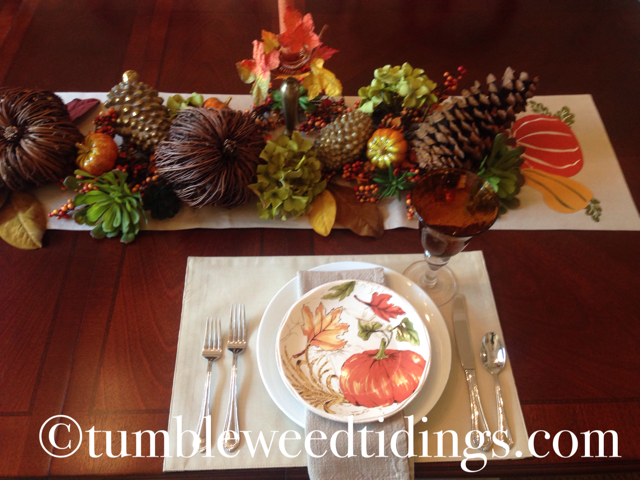 Over the years, I have collected a couple of containers of artificial pumpkins, leaves, and fall themed plates. Bringing them out each year doesn’t cost me a penny, and once I re-evaluate my supply, I can augment and update my stash with a new trending item or two to keep things fresh. 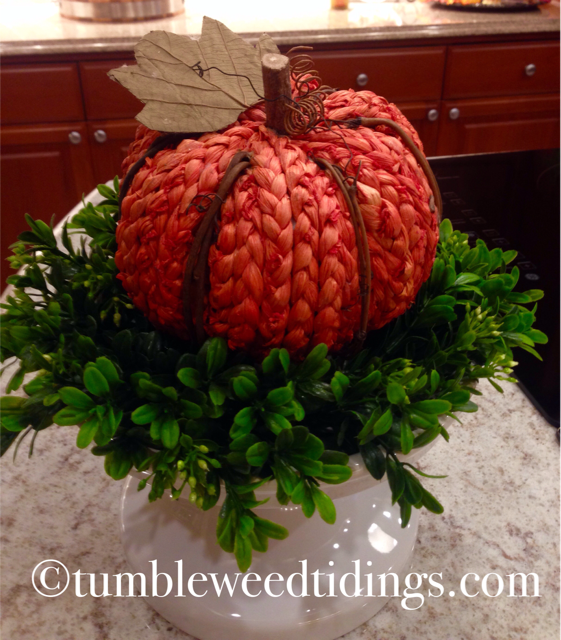 If you are young and just starting out, I would suggest getting a few fall decor pieces mentioned above each year, and starting your own bin of fall décor. A few small items, coupled with the outdoor freebies and grocery store purchases, and you should be well on your way. 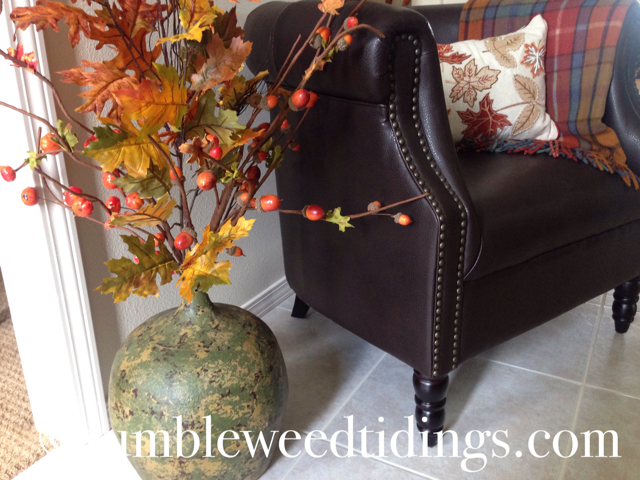 I hope I’ve given you some easy and inexpensive ideas to update your home for the upcoming fall season, and that you too, will fall in love with fall! I enjoyed this very much. Great ideas and photography. Thank you! The photography is something I’m trying to improve at constantly.